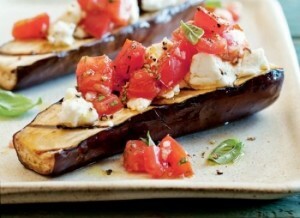 Eggplant is a fun looking thing but most people find it to be rather dull tasting. This will definitely change your mind on that issue. This is a sort of lasagna-ish dish that’s put together with some real magical ingredients, including cheese, tomatoes, basil and grilled eggplant. This is really fast and easy and is probably the most popular grilled eggplant recipe out there – I made that up. All vegetarian BBQ recipes can be made vegan by just leaving the cheese off. Vegans really don’t miss it since they don’t eat it anyway. Pre heat your barbecue grill to 375˚ Fahrenheit. 1. Combine the chopped basil, olive oil, shallots, and the balsamic vinegar in a small bowl. In a separate bowl, stir together the chopped tomatoes and two tablespoons of the oil basting mixture that you just made. Season to taste with Bragg Liquid Aminos. 2. Trim the ends from each eggplant and cut the eggplants in half lengthwise. 3. Place your BBQ Grill Mat on the grill. Spray the grill mat lightly with your favorite olive oil cooking spray. Place the eggplants on the BBQ mat. Generously brush both sides of the eggplant with the oil basting mixture. 3. Cover the eggplants, with a second grill mat or with an inverted cooking pan and cook until tender, which will be about 8 minutes on each side. Remove the eggplants to a dish to add the cheese. Divide the cheese among the eggplant halves, sprinkling it over the top. Place the eggplants back on the BBQ grill mat, cover, and cook until the cheese begins to soften, which will be two or three minutes. 4. Divide into appetizer-sized bites. Spoon the tomato mixture over each and serve right away. Come back often to see the latest vegetarian BBQ recipes from Chef Caron. Previous PostHow Do You Use a BBQ Mat?Next PostCopper Grill Mat – Are They Better Than the Black Ones?